Frustrated because you are not getting the quality shaves you think you should be getting? Maybe it’s time to think of a way of determining where you may be going wrong by documenting some environmental variables for analysis. I decided to use a Google Sheets spreadsheet to create a log to document shaves with: it’s widely available and reasonably flexible. I figured I could list variables in columns with an additional “Result” column to score the shave. Then the “Result” column could be filtered or sorted to see what variables in other columns may be common to certain results. I also added a “Notes” column to account for special circumstances. If this list seems too “geeky” you could always eliminate columns you don’t find useful. For example if you only have one razor you may not need the Razor column. On the other hand if you have a special circumstance that’s not listed here you could always add it. I suggest you use a consistent text format for entries whenever possible. That is, use “Brand X, Scent Y” all the time instead of a more free-form entry. Don’t get too verbose in your entries–save the commentary for the “Notes” column if necessary. 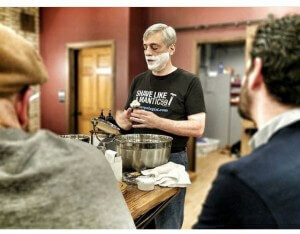 Do you have “hard” or “soft” water for this shave? Hot or cold temperature? Which razor(s) are you using for this shave? If you’re using a continuously adjustable razor this might be the place to list the setting per pass (“2, 4, 3”). If you’re using a razor with different base plates you could note the plate (e.g. “Rockwell 6S, 3”). What brand of blade are you using, and how many shaves have you used it for? You could enter something like “Astra, 3” here. Which brush are you using? You could make this more detailed by listing brand/model or more generic by listing just the hair type (badger, board, horse, synthetic). Along with the obvious variables above there are be some not-so-obvious variables you may not have thought of. Do you shave at different times of day? You could enter the time you shaved, or at least the day-part (“morning”). Do you find yourself shaving in different places? This could be a city you have traveled to or even a different part of the same house (“master bathroom” vs. “guest bathroom”). Was your shave rushed for time? Have the flu? Hungover? Make a brief comment here. The Notes column would list any additional comments you wanted to make about that specific shave. Now it’s time to start generating data. This won’t be an “instant results” kind of thing: you will probably want to have at least 25 shaves under your belt to get any kind of meaningful analysis, and probably more shaves to confirm preliminary theories. As I mentioned early one way to get a quick idea of obvious problems is to sort the spreadsheet on the Result column. That way you can review all the really good (or really bad) shaves to see if there is a trend seen in another column or perhaps a set of circumstances seen by several columns. I’ve created a shareable Google Sheets spreadsheet with some examples and as something you can copy to use yourself. Be sure to download a copy to your desktop or your own Google Drive if you have one–the original sheet can only be viewed, not edited. Have any other suggestions for variables to include? Leave a reply below!